Lake-Sumter State College will host The Short Play Festival 2017 featuring 32 short plays performed in 2 distinct shows. Tickets are $5 and available at the door. LSSC began accepting submissions of 1-minute, 5-minute, and 10-minute plays in October, 2016, and within 2 months, received nearly 900 submissions from writers across the world. Of those, 32 have been selected and divided into two unique shows. Show 1 will be performed on Thursday, April 6th and Saturday, April 8th at 7:30pm and Show 2 will be performed Friday, April 7th at 7:30pm and Sunday, April 9th at 2:00pm. The shows, with several world-premiers, will feature works by a number of prestigious playwrights, including a Juilliard fellow, an Emmy-winning writer, and a recipient of the Academy’s Nicholl Fellowship. 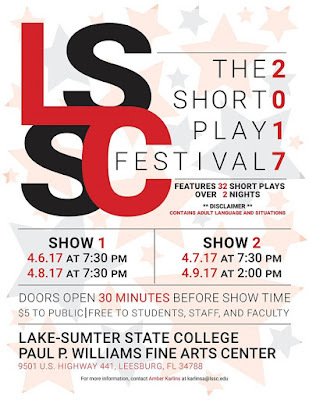 Also among the selected writers are two Lake-Sumter State College students, who have been mentored by LSSC faculty as they prepare their works. Following the performances, the College will be sponsoring their membership to the Dramatist Guild of America. Show 1 will also feature fight direction by Robert Aronowitz, an acclaimed fight director from New York who does fight choreography for colleges and university across the country, including Juilliard and NYU. He has also worked on a number of films and television shows. The shows are directed by Amber Karlins, an LSSC English Instructor. Karlins is also an author, playwright, and screenwriter having won several dozen international writing awards, including Best Screenplay at the Charleston International Film Festival and 3rd place in the Best New Screenwriter category at the London Film Awards. Press invitations to a meet & greet with LSSC students involved in the performances and selected playwrights are forthcoming.